30-50 kmh winds with snow can often limit the options of where and how to fish in Manitoba. Again faced with unfavourable weather we agreed that our best option would be the Red River and a chance at a trophy Greenback. With a few spots that had produced well for us in the past we had the confidence we needed for a hunker down kind of day. 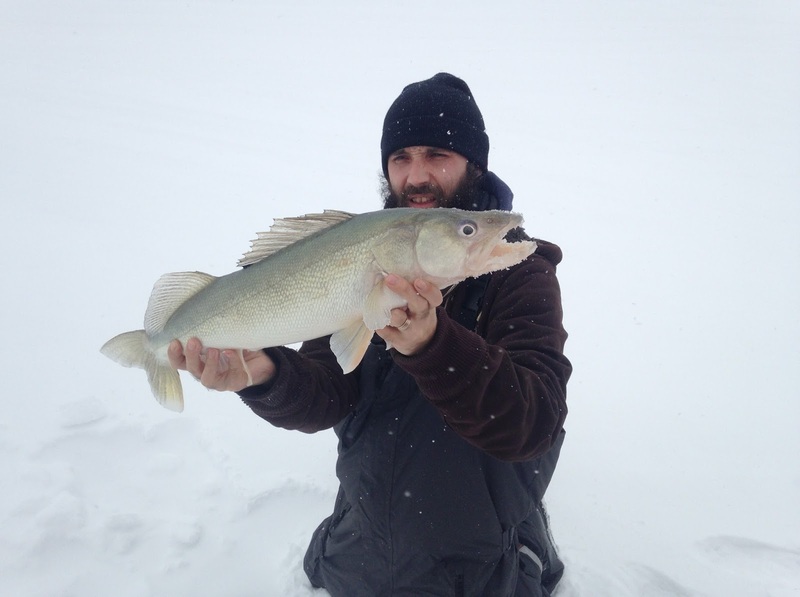 We have hit other locations and targeted other species this ice season but this seems to be turning into the season of the walleye for me. The action was steady all morning and thankfully to our surprise the walleye were out numbering the sauger for once. There were plenty of aggressive marks moving through beneath us and convincing a lot of them to bite was as simple as a lift or a rip with a pause and they would slam it. Most fish were on bottom or near to it but occasionally a big cruising mark around ten feet would show itself. Again the Red would not disappoint as a few bigger girls were caught before 11 AM at 25, 26 and 27 inches. Each one released to fight another day and all equally appreciated. The time was passing extremely slowly, which is a good thing when the fishing is on fire and often agonizing when it is not. 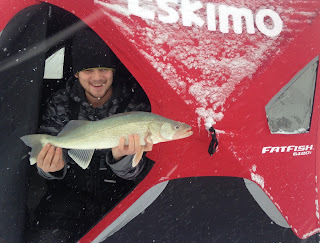 Snow still blowing down and wind from the north like it had been all morning and we continued to catch walleye, sauger and goldeye until just after lunch. Slow, slow, slow. The wind changed from the north to the south around 1 pm and the snow stopped as well. The bite all together basically shut down with any marks being very neutral or even negative. An hour passed with a few fish caught but it wasn't like the morning and many trucks and sleds were packing up for the day. With one fishing partner feeling less than stellar, moving wasn't really an option and we agreed to stick it out for another hour or so. After a few confidence lures had been tried through the lull, I settled on a flasher jig with the biggest minnow from the tub. 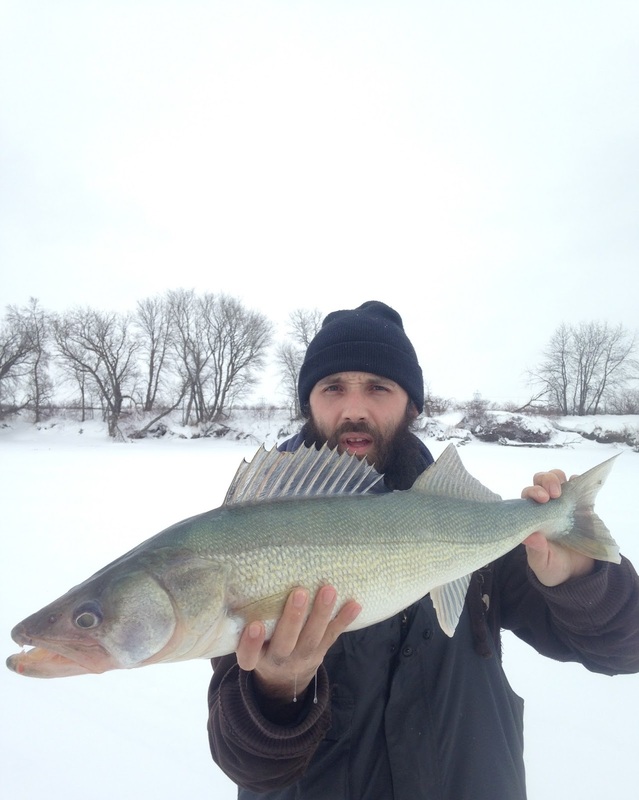 I'm not ashamed to admit that I have lost plenty of big walleye fishing the Red River, it's one of the reasons I keep going back. Redemption and the Red go hand and hand with me, and I have learned so much from the river and it's inhabitants. You are not just fighting a fish, often the current and ice are equal adversaries and the big girls use this to their advantage. With more than a few pride shattering lost fish over a handful of trips I knew it was only a matter of time that the stars would align. With not much to show for my jig and minnow near the bottom I raised it up to 10 feet and began subtly jigging and pausing. Within ten minutes a big red mark showed up on my Humminbird Ice 55 screen just below my jigs mark and with a raise and a wiggle I felt the thump, set the hook and felt the weight. It came up to the bottom of the ice quite easily and then took of on a few short drag pulling runs. Back up to the bottom of the ice and the head shaking started, it did not want to come up. After a good minute and a half of give and take I finally had it lined up and ready to come up through the hole in the 30 inches of ice. Onto the landing mat it went, perfectly proportioned I knew it had to be close to 28 inches and couldn't wait to measure it. It came out at 28.25 and after some pictures it took off with vigor down the ice hole. It was calm through the whole process, almost like it had "been there and done that". Redemption! I wouldn't complain if there was another trip to the Red this winter as it has been worth the drive each time and with the annual ice cutting sure to fire up soon that window is closing.